I don’t know why I never looked into the etymology of font before, but here we have a vivid and satisfying summary. It derives ultimately from Middle French fonder “to melt”, referring to our former need to melt lead so we could make casts of letters for printing. “Technological times may change fast,” Chatfield writes, “but words have their own momentum”, and font “carries a half-millennium of history with it”. As a source of facts and guidance on internet history and culture, the author is engaging and dependable; and as an avid gamer he is particularly strong on its idiosyncratic and “highly functional” lingo, supplying helpful glosses on munchkins, griefers, and carebears, among other curiosities. Being only a very occasional gamer, and then mostly offline, I appreciated these insights. A pleasingly onomatopoeic word – with hints of both ‘nerd’ and ‘worse’ – nerf is also a young term, tracing its roots to the cult 1997 game Ultima Online. . . . At one point in the game’s history its designer, Raph Koster, hosted an online chat to discuss the relative ineffectiveness of weapons like swords in the game as compared to bows or magical spells. Koster promised he would look into the problem of what he called ‘nerf swords’ – a tongue-in-cheek reference to a popular brand of toy foam sword, whose name came from the acronym ‘Non-Expanding Recreational Foam’. Unknowingly, Koster had gifted the gaming world a key term – and one that’s now enshrined in its professional vocabulary, with game designers and companies regularly debating how to ‘nerf’ over-powered aspects of a game’s mechanics. This is one of several entries that show how words coined playfully or even whimsically can fill a linguistic gap and so become adopted as part of a wider lexicon. From here, they may seed other coinages. Chatfield observes that for the first time ever “we live in a culture not only of mass literacy (itself a relatively recent revolution), but of mass participation in written discourse.” You could say that lexical innovation itself has become a massively multiplayer online activity. Chatfield is slightly less sure-footed on linguistic matters. He calls fairytale and lifehacking portmanteau words, but these are compounds; there’s no blending involved. His explanation of eggcorns falls short: it’s not enough to “[substitute] one near-identical sounding word or phrase for another” – that could be a malapropism. Eggcorns are characterised by the fact that the misanalysis makes a kind of naive or intuitive sense. A couple of entries are unnecessarily padded. Half a page on the contents of omnomnomnom.com feels excessive, and I don’t need to be told that an Urban Dictionary entry calls Douglas Adams a great writer. Typos are rare, and are more easily forgiven in a book describing typos as a force for innovation, as in teh and pwn. it’s interesting to speculate what it means to possess once-radical technologies as a birthright. What’s also interesting . . . is the sense in which words like ‘native’ implicitly cast digital technologies as a landscape, or even a land, into which it is possible to be born as a kind of citizen: technologies that are not so much mere tools as a space within which living itself occurs. Times can be defined by their technologies, and ours is conspicuously digital. Netymology sweeps capably from the earliest days of computing (and earlier still) to the newest technological trends and ideas, like Google Glass and Bitcoin. 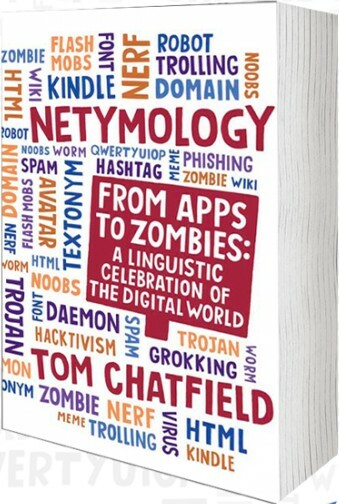 It covers abbreviations (TL;DR, ZOMG) and affixes (meta-, cyber-), fads (owling, flashmobs) and fails (Scunthorpe problem, Streisand effect), cookies and CamelCase, geocaching and typosquatting and a whole lot more. Chatfield says we are today “the conscious agents of our own delight and distraction in a way never previously possible”. Netymology delivers delight and distraction in abundance, and I thoroughly recommend it. You can read an extract and order a copy here, or from the publisher Quercus Books. Disclosure: The author kindly sent me a copy of his book. This entry was posted on Friday, June 7th, 2013 at 9:46 pm and is filed under book reviews, books, etymology, language, language history, words. You can follow any responses to this entry through the RSS 2.0 feed. You can leave a response, or trackback from your own site. “Gaming,” is it? You’re an occasional “gamer”, I see. Recently, a neighbour was gifted a device on which to game; such a pity, as she has, since she was a child, always been gifted in her talent as a flautist. In North America, she is referred to by musicians there as a flutist. Oh jeez, am I confused? Yes, I am. My age is fourty- (oops! Scratch that “u” there…” -nine. Thank you for reading this message, Stan. My Scottish grandmother used to walk to the shops to get the messages needed for feeding her family. I’ll shut the heck up now. Declan: Yes, gaming is the usual word for the activity when the games are digital; I wouldn’t use it for sports or board games. I think play is still the preferred verb, though.